I haven't done a What I Ate Wednesday post in three weeks! And I have been feeling guilty...and also liberated. Documenting your food can get tricky sometimes, especially when you are hungry and you just want to eat, RIGHT NOW. 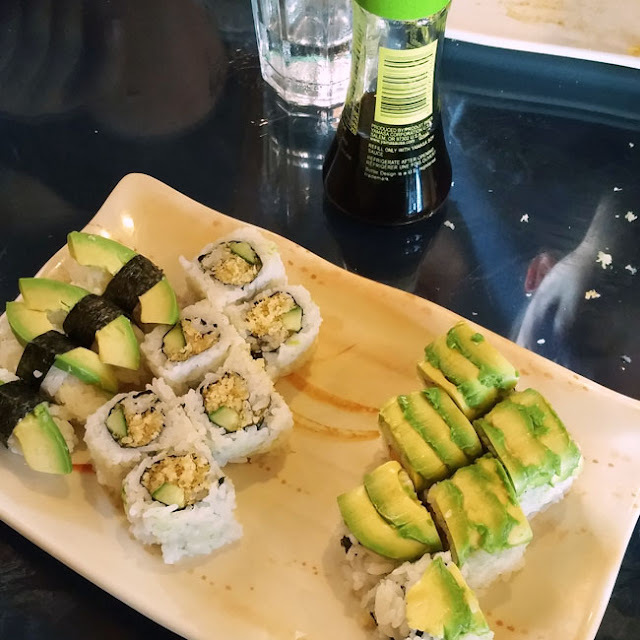 Sometimes I even make the family wait to dig in, like when we're out having sushi and I want a picture of a full plate of maki sushi. You'll see how difficult that is farther down in this post. The camera (but not the ice cream unfortunately) came with me on a little vacay to the KOA 1000 Islands/Ivy Lea. I'll have more about our fun road trip in future. For now I'm sharing a couple of the meals we made from our tidy kabin. 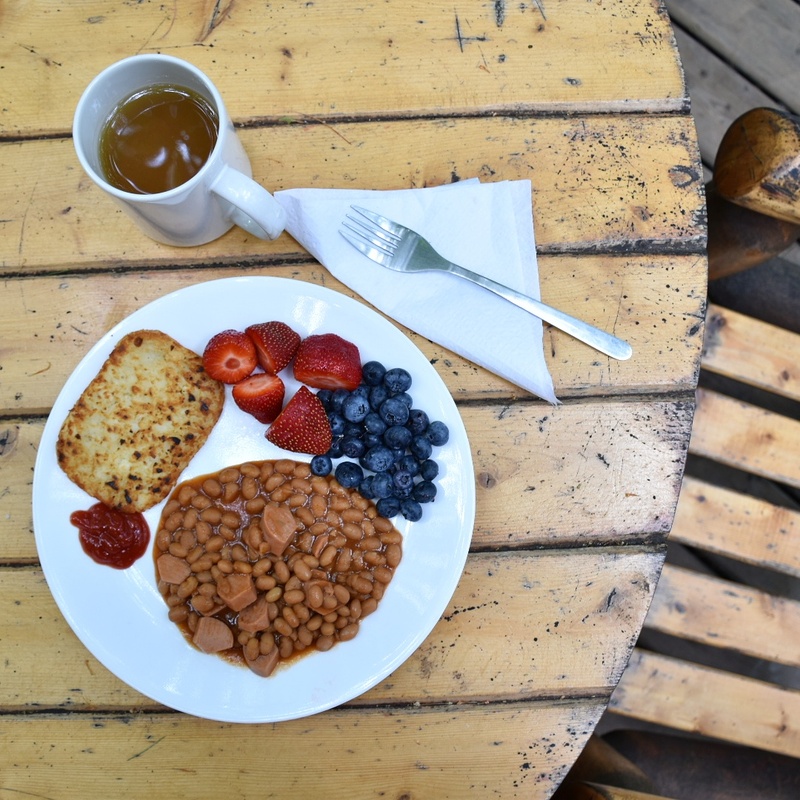 We enjoyed a breakfast of baked beans with sliced veggie hotdogs, hash browns, strawberries and raspberries. For dinner one night, hubby put yellow and green zucchini slices on the barbecue with some potatoes in foil. 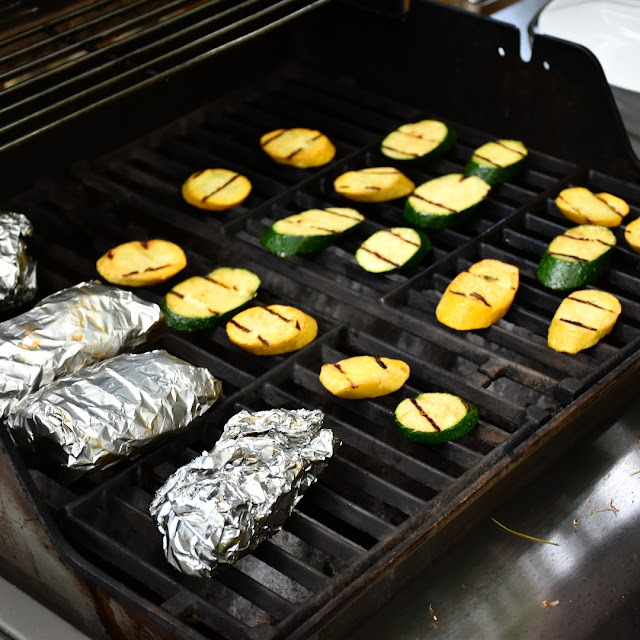 Once those were done he grilled up veggie burgers and veggie hot dogs. I brought along some Chic Choc spiced rum to sample. This rum is made in Quebec from locally grown spices. It has a subtle flavour. I don't like a strongly spiced rum. I really enjoyed Chic Choc. We mixed it with ginger ale and fresh lemon juice and it went down quite nicely. 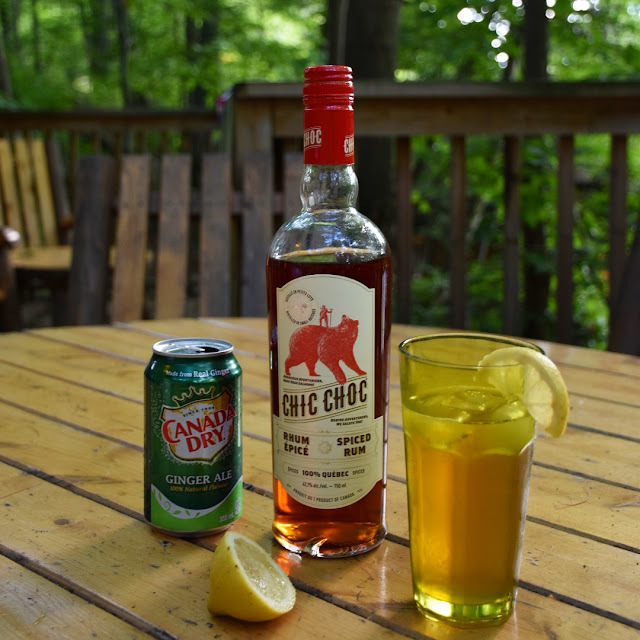 A perfect drink at the cabin or cottage, summer or winter. More fun summer travels. My husband and I went to Niagara Falls to see Harry Connick Jr. (awesome show - now I want to go to New Orleans!). I'm always thinking about food, so I gave some thought to where we could eat along the drive. 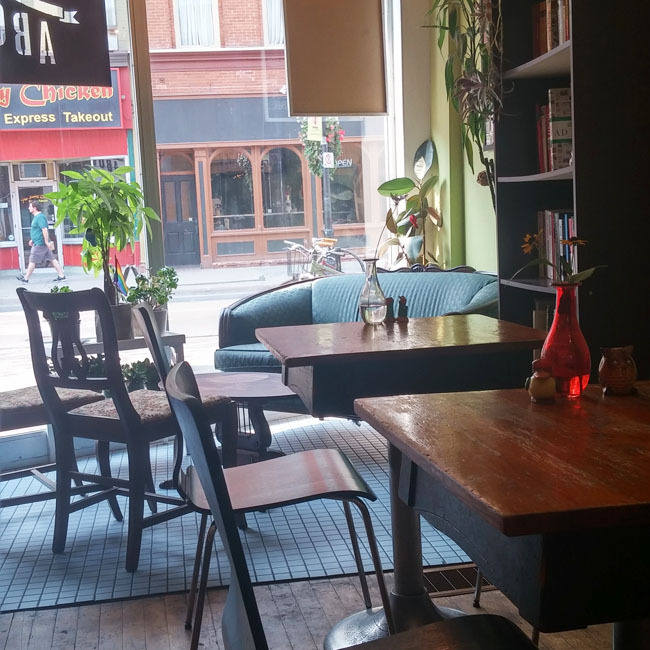 I quickly remembered Rise Above vegan restaurant in St. Catharines. The four of us ate there before and we all loved our meals. Our second visit did not disappoint. 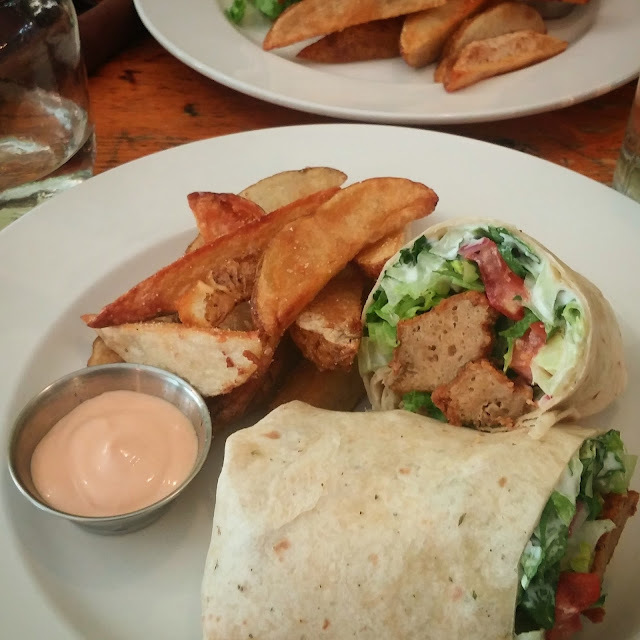 I chose the Crispy Seitan Wrap and it was wonderful, with the most delicious lemon garlic aioli sauce. I was tempted to get the Chickpea Melt that I loved so much last time, but I thought I best try something new! They had some amazing looking cake for dessert too but I was very full from my meal so I had to pass. 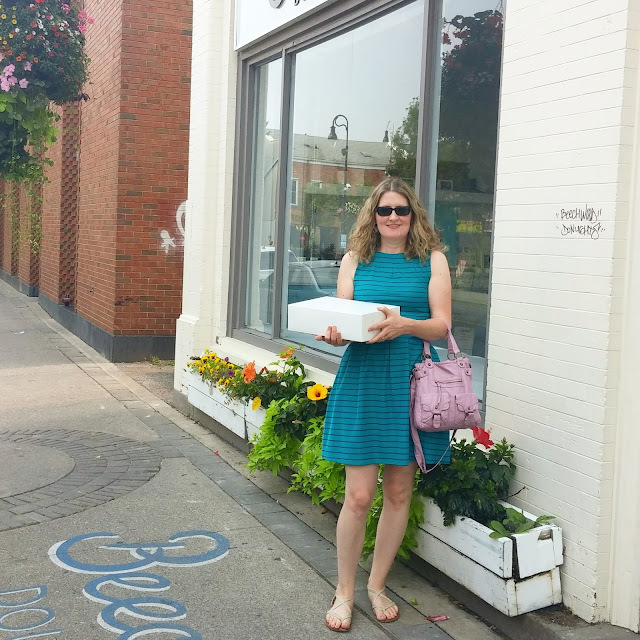 Of course that didn't stop me from heading around the corner to Beechwood Doughnuts. The shop was closed last time we ate at Rise Above, but fortunately it was open this time, and there were plenty of vegan donuts to be had. Whether you are vegan or not, you MUST stop in to Beechwood Doughnuts if you are ever in the area. The donuts (spell it whichever way you wish) are incredible! You will not believe they are vegan. Even I was surprised and I usually believe that anything can be made vegan. But the filling in that beautiful Oreo donut, above left, is so creamy and lovely it will make you gasp. 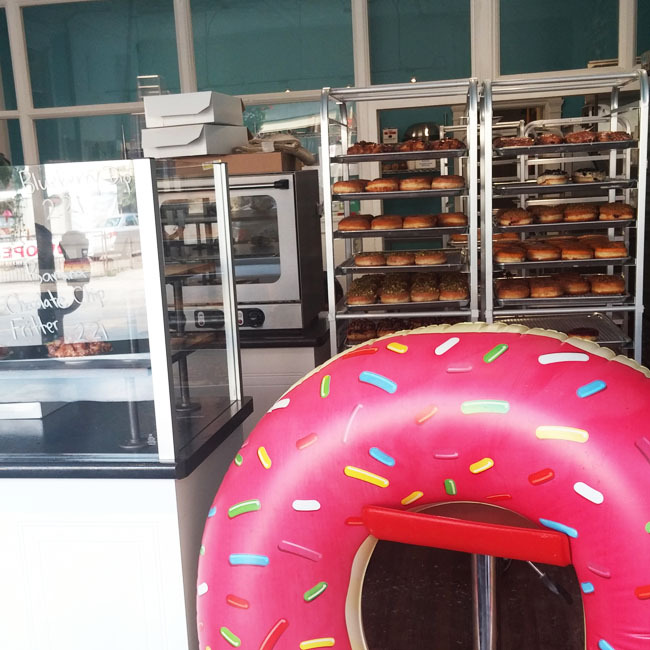 Be forewarned, the Oreo donut is for those who really like the sweet stuff. I got that dutchie-style one at the bottom left of the box for my mom, who we were meeting in Niagara Falls. I asked the girl behind the counter what kind of donut I should pick for a diabetic 80-year-old and she said, "Um, maybe not donuts?" Ha ha, I was only kidding, but seriously it would be rude not to offer Mom a bite or two, right? The ones in the middle are banana fritters with chocolate chips. Good and greasy. 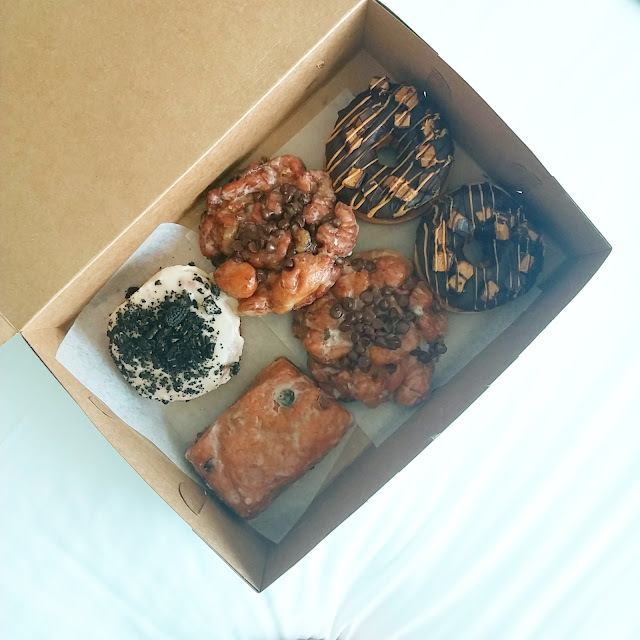 The donuts on the right side of the box are topped with vegan peanut butter cups. Very decadent and delightful. Various meals we've had these last couple of weeks. 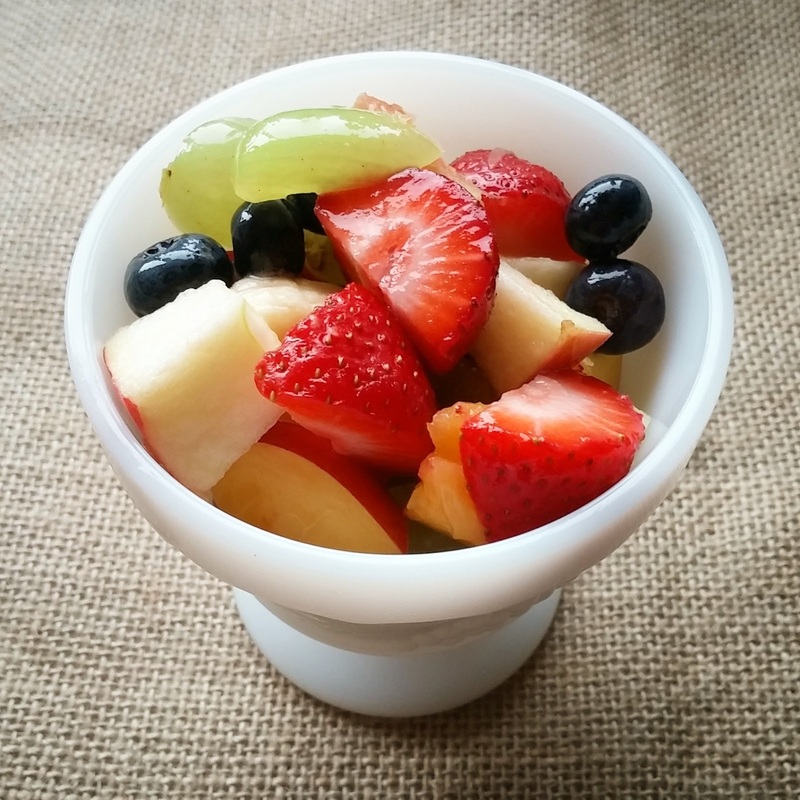 Lots o' fruit, like this fruit cup, above. 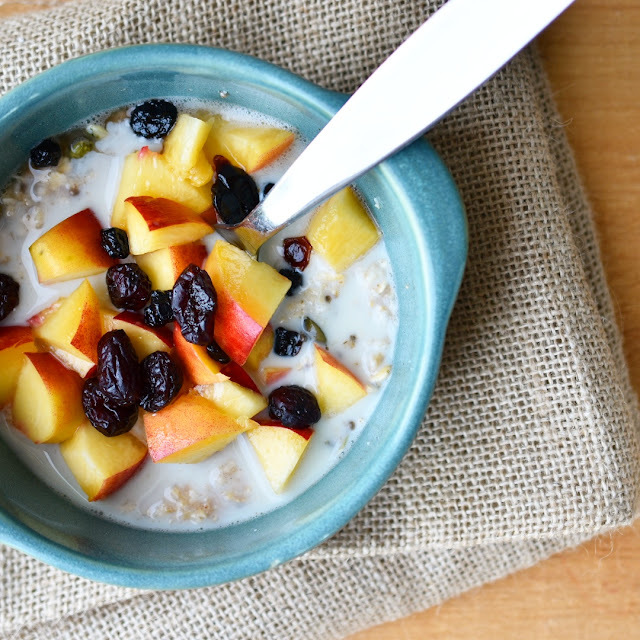 A breakfast of Nature's Path Qi'a Pure Oats Oatmeal Cinnamon Pumpkin Seed topped with diced peaches and dried cranberries and blueberries. And soy milk. 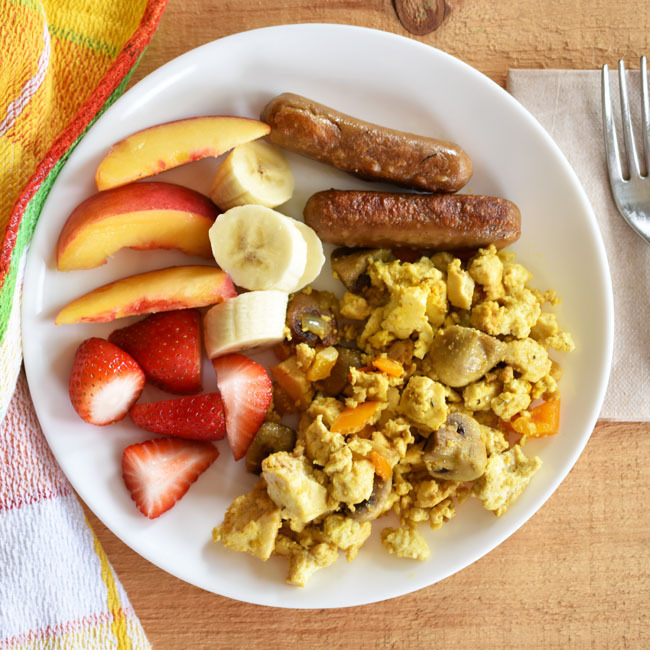 Here's a fun breakfast. We love our Yves vegan breakfast sausage in this house. I cooked up a package of them, along with making a great scrambled tofu with mushrooms and peppers from Doug McNish's Vegan Everyday: 500 Delicious Recipes . 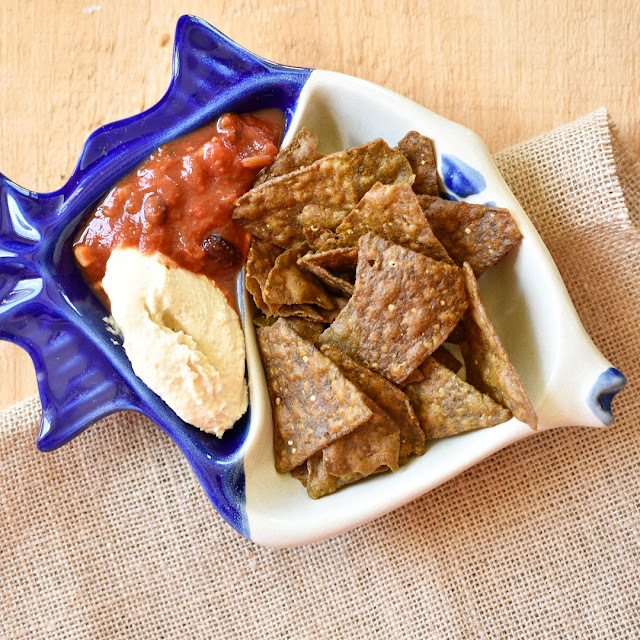 I lunched on these Que Pasa black bean organic artisan tortilla chips with salsa and hummus. I'm gonna be honest - I was a bit afraid to try the tortilla chips because I have been disappointed in some other brands of natural tortilla chips. To my delight, these tortilla chips are crunchy and tasty. My husband came along, grabbed one and said, "These are good." And he's pretty (super) picky. 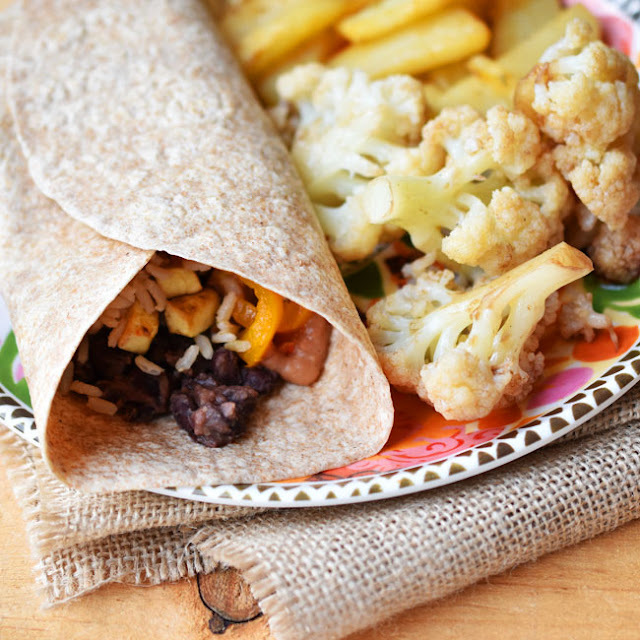 Speaking of my husband, he made these bean burritos for dinner one day, with cauliflower and homemade French fries on the side. He made refried beans for the burrito filling, as well as a mix of sauteed tofu and veggies. 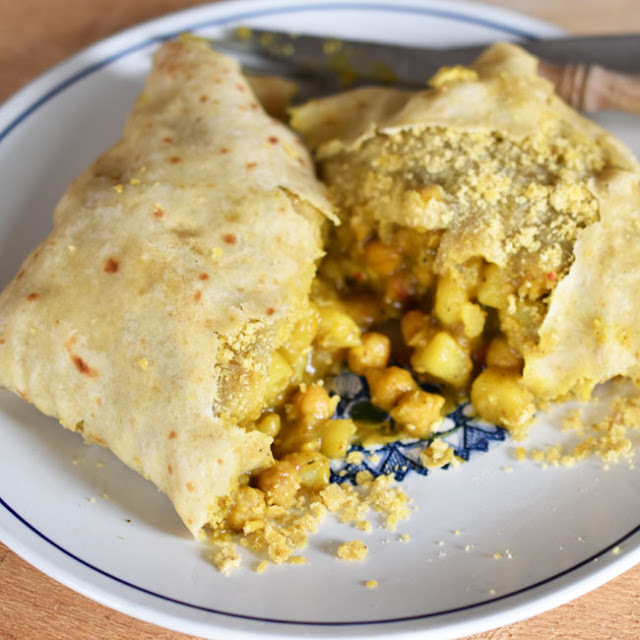 Another day for dinner we got chickpea and potato roti from a local Jamaican restaurant. All I can say is yum. I wish I wasn't too lazy to try making roti myself. And here is that veg sushi lunch I spoke of earlier. The fam and I went out for an all-you-can-eat sushi lunch on Sunday to mark the end of summer vacation. This plate of sushi (including my favourite veggie green dragon rolls on the right) was the second plate of maki rolls they delivered to us. The first time, the little (and big) hands started flying so fast I couldn't get a picture. Even with this second plate, it practically killed them to wait. And I don't blame them. So delicious! How did you mark the end of summer? Any special celebrations? I seem to say yummy every time I read your WIAW post but YUM YUM YUMMY to that ice cream sis. And now I want a Roti. 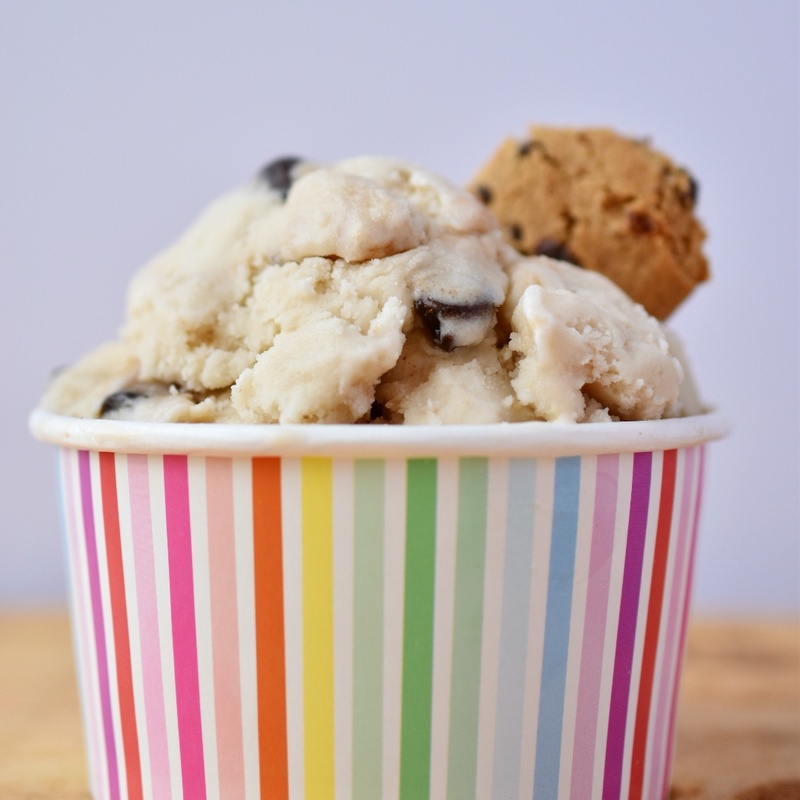 Beautiful pictures of yummy food. I'm always so jealous when you use the words 'vegan restaurant'. Here in Houston it's more 'they have salad'. 'Salad' is not a word (or a thing) I like...Your food all looks so good! Oh my gosh, I HATE when people say, "We have salad." That ain't dinner man. Congrats on the new camera! What a load of fabulous eats there. Ha ha you were too full for cake but went to get donuts, that's what I would do. I find it hard to take the what-I-ate photos too when it keeps everyone waiting!